A comprehensive but non-technical explanation of the many ways in which cancer pain can invariably be relieved. Hover over the name of the book or article you wish to download to see the instructions (most files can be downloaded directly from this page, but if there are various available versions you will be taken to a new page to choose your dowload). When reading any of the PDF files, their Bookmarks (effectively a hyperlinked table of contents) can usually be displayed via a tab or icon near the left side of the window, or alternatively via the application's menu bar or a toolbar. NOTE: All Wanterfall eBooks and Articles are published under a Creative Commons license which allows you to copy, adapt or distribute them in any format and in any quantity, either free of charge or on a not-for-profit basis. There is no need to contact Wanterfall eBooks for permission - just distribute the information wherever you think it may be helpful! 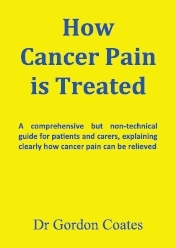 For any enquiries, or to order printed copies of the second edition of How Cancer Pain is Treated, send an email to sales@wanterfall.com or use the link below. If your computer or mobile device cannot open PDF files, click on one of the links to the left to get the free Adobe Reader application. Alternatively, apps such as Evernote (for most devices) and Files or Files Pro (for iOS) will also open PDF files.